$15 million comes from the Simons Foundation. The Simons Foundation founded by Jim Simons and his wife, Marilyn. A total of $15 million will support two programs. $5 million of the funds will establish a joint program which fosters collaboration among biologists, mathematicians, physicists and computer scientists exploring quantitative and theoretical approaches to biological problems, the program will support faculty members, fellows, visiting professors and a program of conferences, workshops and seminars to be shared between the two institutions. $10 million will launch a new fund called the Fund to Sustain Scientific Excellence at Rockefeller University. The fund will allow the university to move ahead robustly with its scientific agenda despite the economic downturn and, in conjunction with cost-cutting measures, help sustain the university’s balance sheet during these difficult economic times. $3.18 million comes from the Raymond and Beverly Sackler Foundation. This gift will endow new postdoctoral fellowships as well as help pay for visiting professors in the center for studies in Physics and Biology. Raymond Sackler and his wife, Beverly, support scientific research through their foundation at universities across the globe. They are best known for endowing the Raymond and Beverly Sackler International Prize for Physics and Chemistry. The $3.18 million will be used to designate the Raymond and Beverly Sackler Laboratories of Biomedicine and Biophysics on the first floor of the Detlev W. Bronk Laboratory at Rockefeller University. $6 Million comes from the Presidential Fellowship in honor of John C. Whitehead. John C. Whitehead is a member of the university’s board since 1989. He contributed $6 million to endow the Presidential Fellowships in the Center for Studies in Physics and Biology in 2005. The John C. Whitehead Presidential Fellows will not be confined to an individual lab but will determine their own biomedical research and collaborate across the campus. $5 million comes from the Heilbrunn family. The late philanthropist Robert and Harriet Heilbrunn’s two daughters, Helaine Lerner and Joan Rechnitz, contributed $5 million to honor their parents who are university benefactors for more than a decade. This money will be used to endow a new center for research nursing at the Rockefeller University Hospital. The Heilbrunn Family Center for Research Nursing will focus on both patient care and provide high standard training. Rockefeller University has received over $55 million from private donators by May 2014. These funds make the university one of the most profitable markets for laboratory supply companies. 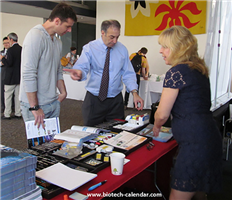 Increasing research supply sales at Rockefeller University is made easy by exhibiting with Biotechnology Calendar, Inc. at the BioResearch Product Faire™ Event. The next BioResearch Product Faire™ Event at Rockefeller University is on October 1st 2014. 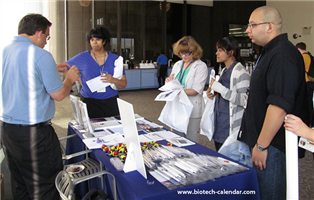 Last year, the BioResearch Product Faire™ Event at Rockefeller University attracted 513 attendees. Of these attendees, 111 were purchasing agents, professors and post docs, and 49 were lab managers. These attendees came from 24 different research buildings and 65 on-campus departments. If you are a laboratory supply company and would like the opportunity to demonstrate your products at Rockefeller University, please click the button below for more information about the Rockefeller BioResearch Product Faire™ Event on October 1st 2014. There are more information about different shows at different institutions across the nation. Please read: Show Schedule for 2014.